MUNICH — Everything looked ready for its close-up, Mr. DeMille, at Die Frau ohne Schatten last night (Nov. 21). Down to the last falcon feather. 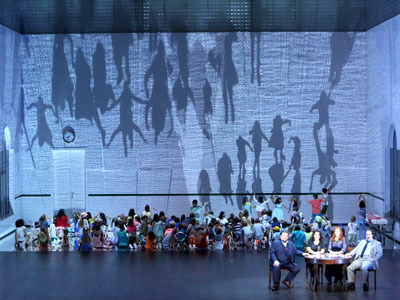 When the cameras roll for a Dec. 1 live stream of this new Bavarian State Opera production, the copious blue-greens, red and purple accents, photo-realistic surfaces, world-of-wildlife accessories, and yes, even Krzysztof Warlikowski’s dramaturgy, should block, pan and zoom handsomely, variedly. From a fixed seat in the National Theater, though, visual stimulus was scarce once the viewer tired of the staging’s massed white tiles or wood panels at a certain distance, and its falconine helmets. Ironically the theater building itself was ostensive hero yesterday. Exactly fifty years have passed since it reopened, with this same epic opera, after a 1943 pummeling by American and British bombers, much recalled this season in dozens of black-and-white promotional images and a fat new book. The festive evening also marked Day One of public opera duty for the company’s new Generalmusikdirektor Kirill Petrenko and, remarkably, the first complete performance in Munich of the grandest score (1915) of local lad Richard Strauss. The music triumphed. Warlikowski shifts Hugo von Hofmannsthal’s story of regeneration to a 1940s sanatorium — cure facility à la Thomas Mann, not madhouse. The Kaiser and Kaiserin (Johan Botha and Adrianne Pieczonka) are customers. Barak and wife (Wolfgang Koch and Elena Pankratova) have traded dyeing work for careers in spa-based healthcare, specifically in the establishment’s busy laundry. Prone to hearing voices, self-identifying as a gazelle, and troubled with visions of her husband turned to stone, the Kaiserin has submitted to a drugged-out regimen of extended lounging, accompanied by her fawning, pawing, animated gay Amme (Deborah Polaski). Trips between the earthly and spiritual planes of the Hofmannsthal scheme are reduced to walks and elevator rides around a wing of the sanatorium. But Warlikowski compensates. Pretty raptors — more of them than a hunting Kaiser could need, and more than would ever get along in the wild — enliven scenes with deft sudden neck-rotations. Keikobad is enacted as a bent stick-insect of a man on a cane, a silent Max Schreck in need of chiropractic. Video projections provide aqueous segues in the action, and clips from Resnais’s L’année dernière à Marienbad throw at least an opening light on the imperial couple; Warlikowski fails to close it out. Miraculously Petrenko mastered pit-and-stage balances on this first night, something his predecessor seldom did in seven years with the Bavarian State Orchestra. (Guest conductors typically get them wrong, too. Ivor Bolton succeeds, but he has worked here for two decades and favors more temperate music.) These, and restrained, beautifully intoned woodwind playing alone made the listening a pleasure. But the strings, besides, emitted wondrous silky shimmers we don’t often hear. Then there was the singing, none of it forced or shrill. Pieczonka reveled in warm, glorious tones, from the agile passages of Act I to the trenchant, focused declamation of her trial. She had no need to milk Ich will nicht! because she had built up the scene so powerfully leading to it. Polaski made her character a credible close presence in the Kaiserin’s life, sustaining the director’s conception. She sang with impeccable control (at age 64) and let loose new energy in her final, bitter scene. Botha had the notes, even if his pitch wavered here and there. Koch, in the shoes of Dietrich Fischer-Dieskau fifty years ago, furnished his role with a pleasing cantabile sound. In Act III’s Schweiget doch, ihr Stimmen! … Mir anvertraut, dass ich sie hege sequence, he wisely declined to push to match Pankratova’s volume. Without a home of her own in Warlikowski’s staging, the role of the Färberin is curbed dramatically. Pankratova made her considerable impact last night mostly through the music, painting words in detail, coyly in her early dialog with the Amme, and shaping vocal lines tellingly rather than coming on strong with her mighty instrument. Supporting roles were well taken. Vocal-ensemble and choral contributions had evidently been tightly rehearsed, although some lapses of coordination marred the last pages of the opera. Realized with ideal balances and alert intonation, Strauss’s uncut music rose from the bottom under Petrenko, its counterpoint resilient and its parts properly weighted. Not a single ugly note sounded all evening, vocal or instrumental. No one audibly tired. Oddly for a premiere here, no one booed at curtain, not even at the director and his team. And the five hours flew by. This entry was posted on Friday, November 22nd, 2013 at 5:27 pm	and is filed under Munich Times. You can follow any responses to this entry through the RSS 2.0 feed. Both comments and pings are currently closed.